Two Ukrainian askaris peer into a doorway past the bodies of Jews killed during the suppression of the Warsaw Ghetto Uprising, 1943. 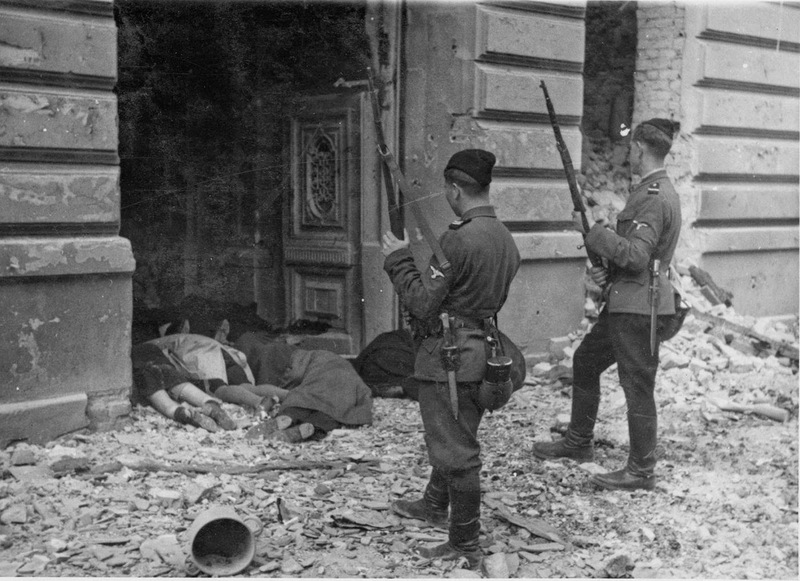 Two Ukrainian askaris peer into a doorway past the bodies of Jews killed during the suppression of the Warsaw Ghetto Uprising. The original German caption reads: “Ukrainian askaris used during the operation”. During WWII, the Germans used the term “askaris” for Red Army deserters who formed units fighting against the Red Army and in other actions on the Eastern Front. They were largely Ukrainians and Russians. Askaris troops were not part of SS, they were just auxiliary troops. The word askari is a loan word from Arabic meaning “soldier”, which in turn is from Persian (lascar – meaning “army”). In the context of World War II the term often has connotations of collaborationism, and (in the case of the occupied Soviet territories) of anti-Bolshevism (and widely presented by Germans as such). From April 19 to May 16, 1943, during World War II (1939-45), residents of the Jewish ghetto in Nazi-occupied Warsaw, Poland, staged an armed revolt against deportations to extermination camps. On April 19, 1943, the Warsaw ghetto uprising began after German troops and police entered the ghetto to deport its surviving inhabitants. Seven hundred and fifty fighters fought the heavily armed and well-trained Germans. The ghetto fighters were able to hold out for nearly a month, but on May 16, 1943, the revolt ended. The Germans had slowly crushed the resistance. Of the more than 56,000 Jews captured, about 7,000 were shot, and the remainder were deported to camps. This Uprising was the largest single revolt by Jews during World War II. So if the truth were known, I wonder how this caption would really read? Did the Germans kill the dead here or did the Soviets? About a 50-50 chance for either if you ask me. The soviets were a 1000 miles away at the time. these are askaris ("native" troops). As their equipment is standard German issue (Mauser 98 rifles etc), they are most likely Ukranians - who actually formed substantial german led units.Caption doesn't claim to know who did the actual killing here. why ukrainien? Its antiukrainian propaganda today? Ukrainian fought along with Germans, not against. Askaris weren't Ukrainian,they were Latvian,however it doesn't disqualifying Ukrainian participation in Holocaust and Genocide of other nations. I cannot imagine how a particular group of people in a false concept of nationality can be so brutal against another as to do acts of inhumanity by murdering men, women and children, as if they are the ones entitled to live on this planet. Why can't we forego of hatred and selfishness and embrace the higher and more noble values of Love, justice and brotherhood? for all of us are merely transients on this earth. The rifles these troops are carrying are Soviet Mosin-Nagants ... not German k98 Mausers ... but they are clearly allied with Germany as they are carrying other German gear and are wearing SS eagles on their left sleeves ... probably part of the Ukrainian Kaminsky brigade. "They were largely Ukrainians and Russians." So, why then Ukrainians? Russians are well known for brutal actions in Europe. Most people have cant read English, The description says and I quote: "The original German caption reads: “Ukrainian askaris used during the operation”." Do you understand now? The photo has German caption on the back, like most war photos do. The unit trained in the village of Trawniki was made up of Ukrainians, Russians, Belorussians, Poles, Estonians, Lithuanians, Latvians, ethnic Germans, Kazakhs and Tartars. What makes me flabbergasted is the old hatred and nationalistic competition between readers from different East European nations, and holocaust liers, as if there were the slighest doubt about hat had happened and who killed, three quarters of a century after the facts. What about reading a bit in the sources before commenting and showing lack of knowledge and a certain level of bad faith? A good source is Kazimierz Moczarski book about his "Conversations with an Executioner", i.e.with SS-General Stroop - the killer of the Warshaw ghetto uprising. We used the word 'askaris' for the volunteers serving with our auxiliary forces in the SS, recruited from the indigenous populations in the areas acquired in Eastern Europe. They were, in principle, Latvians, Lithuanians, Belarusians and Ukrainians. They were trained at the 'SS-Ausbildungslager-Trawniki' near Lublin. They did not make the best of soldiers, although they were nationalists and anti-Semites. Young people, often without the elementary education, culturally savage, with inclination to cheating. But obedient, physically tough and steadfast against the enemy. Many 'askaris' we used during the 'Grossaktion' (especially in its initial stages) were Latvians. They did not understand Polish and therefore were unable to communicate with the people of Warsaw. This was exactly what we wanted. We also called them "Trawniki men". source: Andrzej Szczypiorski (1977), Moczarski Kazimierz, Rozmowy z katem text with Notes and Biography by Andrzej Krzysztof Kunert (PDF 1.86 MB, available from Scribd.com). Page 103. Retrieved August 28, 2014. (in Polish), from the Wikipedia page on "Trawniki men"